Today’s consumers value live experiences more than material goods and expect those experiences to speak to them on a personal level, and to respond to their needs for information, community and fun. Brand experiences that satisfy these needs and are meaningful and engaging lead to consumer loyalty and brand advocates. Today more than ever, brand experiences should be at the center of any well-conceived marketing strategy. 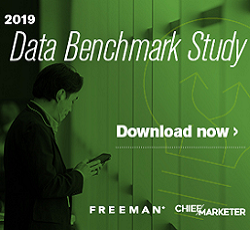 In fact: More than two- thirds of marketers agree that brand experience is an effective way to achieve their organizations’ goals. 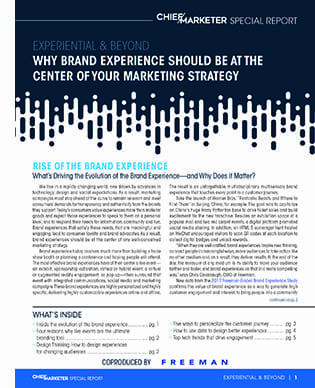 In this Chief Marketer Special Report—which includes insights from industry experts Bruce Mau, Andy Cunningham and Haluk Kulin—you’ll learn what’s driving this evolution of the brand experience, and how you can create smart, personalized and engaging experiences that are on-trend—and on target.